Fine Gael TD Noel Rock has lodged an official complaint with the Office of the Director of Corporate Enforcement (ODCE) about the €100,000 bridging loan that John Delaney gave to the Football Association of Ireland. The TD made the complaint after the FAI's finances came under intense scrutiny following revelations about the then chief executive's loan. It is understood the complaint refers to undisclosed issues around expenditure and balance sheet issues at the FAI. In a statement last week, the FAI said it had written to the ODCE "offering clarification" on the transaction. It came after it emerged that Delaney gave a €100,000 bridging loan to the FAI in April 2017. The transaction, which was not mentioned in the association's annual accounts, was repaid to Delaney a few months later. Last night the FAI announced that Delaney is stepping down as CEO and will take up the role of Executive Vice President, where he will receive a salary in the region of €120,000. The FAI have also confirmed that John Delaney will attend a meeting with the Oireachtas Committee on Sport next month. There was speculation surrounding whether Delaney would still appear at the Oireachtas committee meeting but in a statement, the FAI said that he would attend. "As was stated last week, John Delaney will be part of the delegation that meets with the Oireachtas Committee on Sport next month. 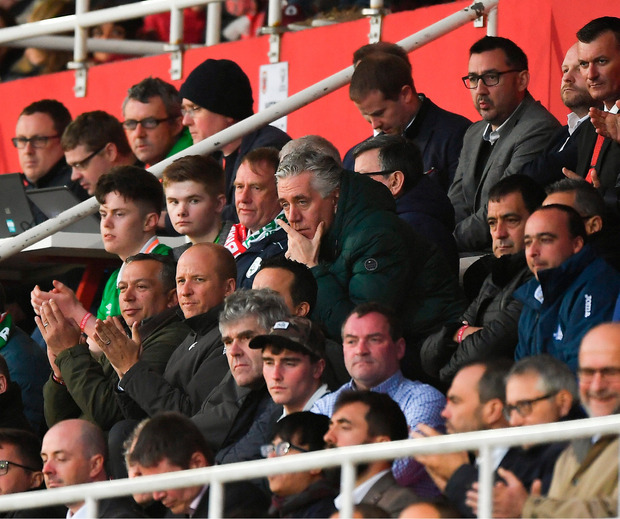 "That meeting is currently scheduled for April 10th and the FAI has written to the committee offering to bring the meeting forward to April 3rd." The FAI also said that Delaney has taken a 'substantial reduction in salary' in his new role. 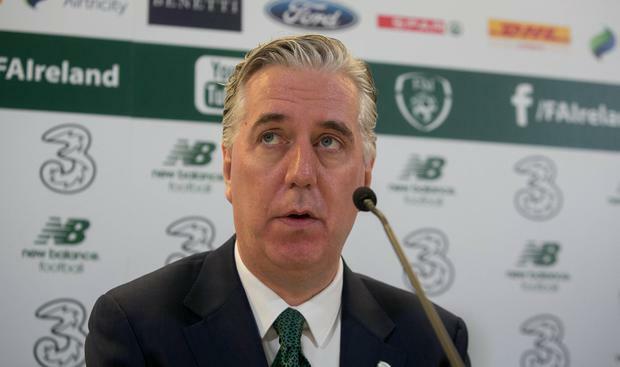 "As regards John Delaney's salary in his new role as Executive Vice-President, the FAI can confirm that the salary is substantially less than the salary he previously received as CEO." FAI COO Rea Walshe has been appointed interim CEO, with the association confirming that they hope to unveil a permanent hire at their AGM in July. "The new role of Executive Vice-President would be a specific defined role with responsibility for a range of international matters and special projects on behalf of the FAI. It is envisaged that the current CEO would step into this new role. This would allow Irish football to continue to benefit from his extensive football experience and contacts across Europe and the rest of the world." Sport Minister Shane Ross has asked Sport Ireland to compile a report on the issue which is expected in the coming days. After responding to Sport Ireland, the FAI released a statement saying it had "answered all queries" raised by the sports governance body. Sport Ireland has not issued a statement since. Noel Rock last week told the Floating Voter podcast that he was open to listening to Delaney's explanation about the transaction. Before the announcement of Delaney's new role last night, the deputy said Delaney's performance as the head of Irish football was not living up to his "Rolls Royce salary" and insisted he should resign from the €360,000-a-year position. Rock, who is a member of the Oireachtas Sport Committee, argued that the issue of the loan was "overshadowing" the on-field performance of the Ireland team. Tanaiste Simon Coveney said it was "too far early" to talk about the former FAI chief's position, while Justice Minister Charlie Flanagan was also critical of Noel Rock's comments. However, Taoiseach Leo Varadkar said the loan seemed "a bit unusual," as he believed the FAI would have access to bank loans. "I would have thought it has banking facilities that would have provided for a loan and I know that Sport Ireland and the joint committee of the Oireachtas will want to ask some questions as to why that came about," he said.